If you want me to get not only excited but really excited for a holiday dinner, mention the words grilled prime rib. Don’t get me wrong, I’m still coming to dinner if the roast was prepared in the oven, but I’m going to start a two-week countdown if it’s going on the grill. This is one of my favorite meals not just to eat, but to prepare. I get a thrill prepping upwards of 7 pounds of meat and 3 huge rib bones for the kettle. It’s like wrapping a gift and waiting for a loved one to open it. The grill provides a fantastic transformation to what some consider a daunting cut of meat to prepare. Prime rib isn’t cheap, but it IS easy to grill and the results better than most restaurants. I love larger cuts of meat around the holidays, as it gives me breathing room. I can get the meat on the grill and still have several hours to work on the sides and other parts of the meal. There is no need to rush and the only emotion I’m battling as the potatoes are mashed and the glasses are filled is anticipation. If there was ever a time to go big for the holidays, this classic Jamie Purviance recipe is it. The peppercorn crust brushed by the wisps of smoldering oak is only improved on by a dip in the herb hazelnut pesto. It’s a meal your guests, or your belly, will ever forget. Prime rib takes a long time to cook and with the colder weather that most of us have around the holidays, you are going to want your grill to stay nice and warm, so that means no peeking! This is where the iGrill comes in! 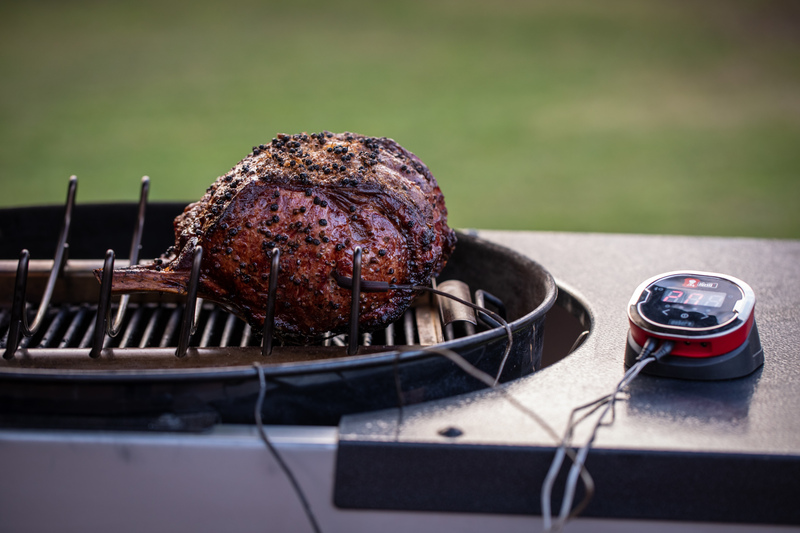 The iGrill is an app-connected thermometer that will send alerts right to your phone about the internal doneness of the prime rib, so that you don't under or worse- over cook it. 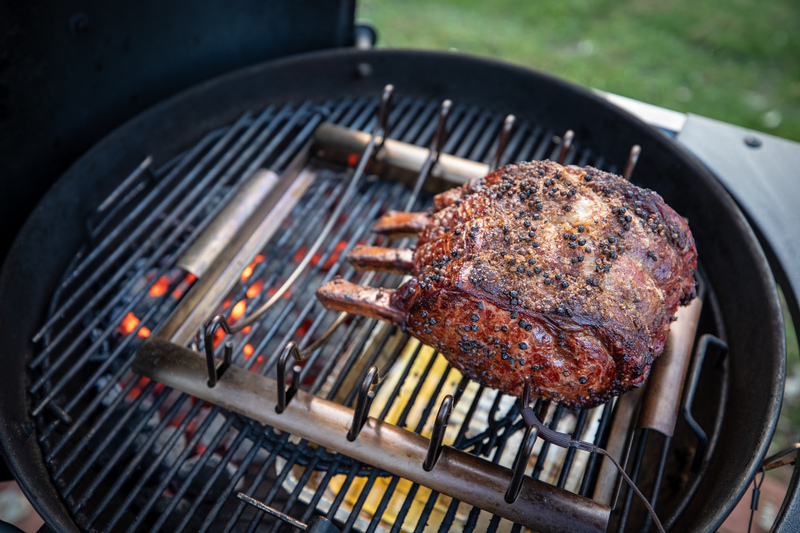 Use the 2-in-1 premium barbecue rack for your prime rib with a drip pan directly underneath to catch the drippings and keep the grill clean. Flip it over, and you can fit up to 5 racks of ribs. This recipe calls for a little smoke flavor and apple is perfect! 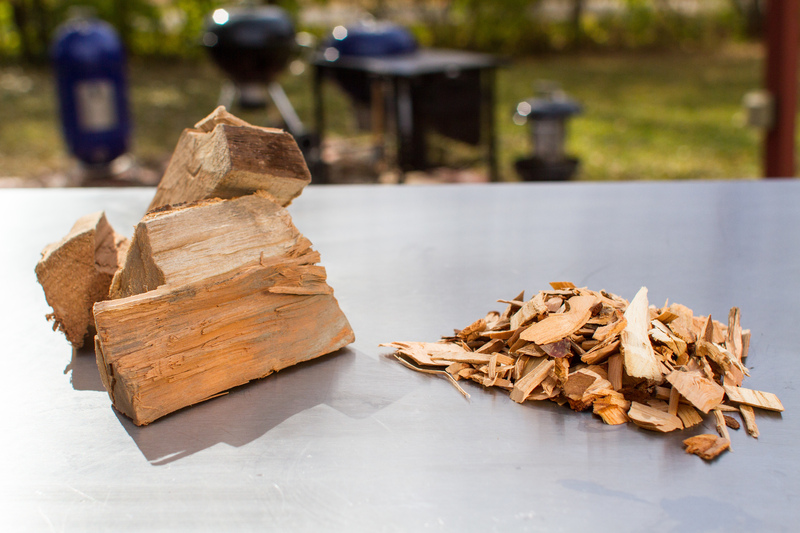 Use chips in your charcoal or gas grill, chunks in your smoker. 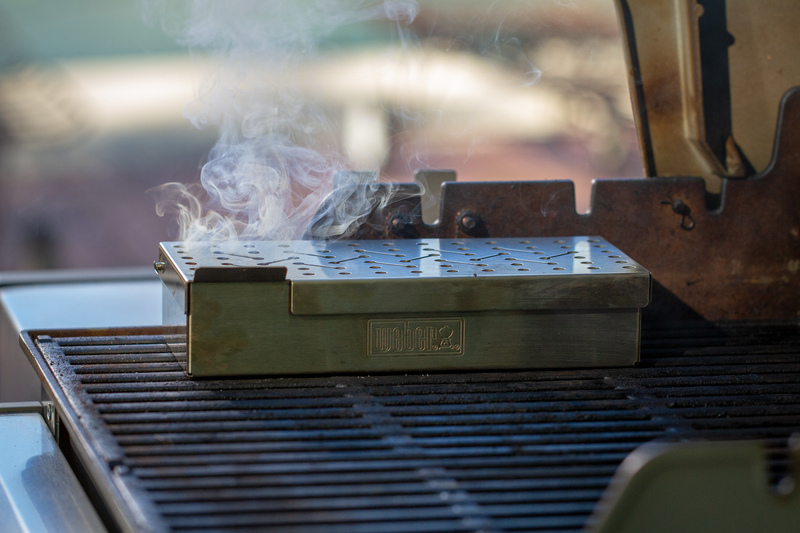 Add a smoker box to any gas grill to turn your grill into a smoker. Soak the chips for 30 minutes in water and then add them to the box. Get more tips on smoking on your gas grill here.